The King of Pyropuff Peak is the 10th course of Episode 1 in Captain Toad: Treasure Tracker. This level takes place inside a volcano called Pyropuff Peak. To unlock this stage, the player must have collected at least 12 Super Gems. 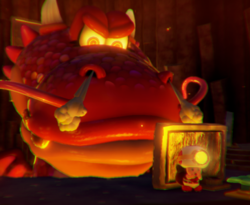 Captain Toad must climb to the top while avoiding Draggadon's fire and the lava that rises when Captain Toad reaches certain parts of the level (which prevents him from back-tracking). When he reaches the top, the platform with the Power Star falls onto the dragon, putting it unconscious, allowing Captain Toad to take the Power Star from atop its head. Super Gem 1: Found in front of the first rock-shield in the course. Super Gem 2: Obtained by riding the moving ladder halfway up the mountain. Super Gem 3: Inside a Pluck Patch near the top of the course.